Whoever said that a smartphone is the extension of someone’s hand was spot-on. For it seems that every time someone gets an ache or a pain, the first thing they do is consult their phone or tablet, not their doctor. Over the past two years the number of health apps downloaded across multiple platforms reached past 400 million downloads. With a global revenue of $1.3 billion from mhealth apps in 2012, that figure is estimated to be $11.8 billion by 2018. The increase of revenue stems from downloads, in-app advertisements, mHealth services, direct transactions and sensor sales. As a number of big healthcare companies published mHealth apps in 2012 that go far beyond a simple allergy tracker or pill reminder (e.g. Sanofi Aventis’ sensor-based iBGStar Diabetis monitoring app) sensors are a growing part of the landscape. 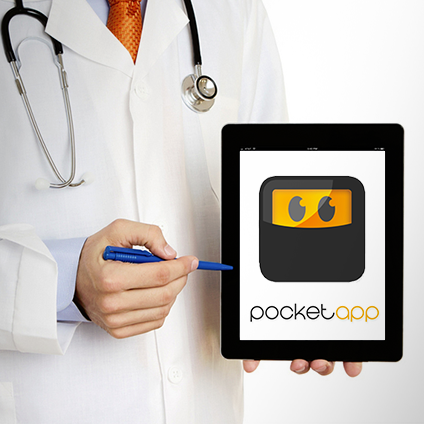 The Pocket App team is also working on some interesting projects in the mHealth sector. This includes iPad and Android tablet apps for the Royal College of Physicians in Edinburgh, developing Android tablet apps aimed at hospital patients for Med ePad and most excitingly, we’re currently in discussions with the World Health Organisation, regarding apps that can be leveraged globally to provide important health information and advice. For more details on the rapid rise of mobile health management tools, have a look at this interesting infographic!